I learned something new about the iPhone 7+ camera(s). Smartphones are handy in that you can sometimes get them into spaces where an IL camera won't fit, but the "selfie" camera on the screen side of the phone doesn't focus as close as the main camera modules on the back. I couldn't see to compose this picture any other way than by using the "selfie" camera, and it wouldn't focus on the eggs. The nest is right under the eaves and I couldn't get the phone far enough away. These eggs have apparently been abandoned, which is making me unaccountably sad, probably because it echoes the rest of the sadness in my life. A mother robin raised an earlier brood in my robin condos under the pavilion (there are now three nests, which are re-used year after year), and I even got to see one of the fledglings make its first flight—a first for me—because I dropped something by mistake and scared the little guy right out of the nest. There has since been a second batch—robins will raise up to three batches of eggs per season—but the mother of the second batch seemed more nervous than the others, and never entirely got used to me and the dogs like the others did. 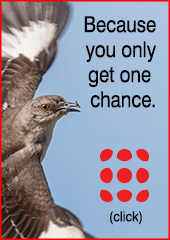 Then one day she wasn't at her nest, nor the next day either, and I became concerned. The third day I saw a robin standing on the edge of the nest and I thought, good, she's back! But then two more days went by with no signs of life. That's when I decided to stand on a stool and, carefully, not touching anything, use the phone camera to spy into the nest; I wanted to see if some predator had gotten the eggs and they were gone. As you can see, the camera showed the eggs still there. But it's been two days now since the photo and I haven't seen any further signs of the mother. It's such an enormous investment of effort to raise a brood of chicks that robin parents will abandon the task if there isn't a reasonable chance of success. If the mother is killed, of course, the eggs are doomed. The male can't incubate the eggs and doesn't know the other necessary behaviors such as turning the eggs. But the mother will often abandon the eggs if the male is killed, too—one website notes that the male performs "finishing school" for the fledglings, teaching them how to gather food and other worldly skills. Without him, the youngsters' chances of survival go way down. What I suspect happened in this case is that the mother was killed and the bird I saw hanging around the nest on the third day was the male. But I'm no ornithologist, and of course I have no way of investigating or knowing what became of this poor family. Whatever happened, it appears that the eggs in this blurry picture are never going to become birds to add to the ever-diminishing avian population, alas. As you might already know, Famous Author ™ Tom Wolfe has died. Encomia proliferate. David Douglas of Newsweek called him "more of a celebrity than the celebrities he describes," which was true at least when I was young. I don't know about the later big thick square novels—I once manfully tried to make it through Bonfire of the Vanities but fetched up against the rocky shores of my own inadequacies, and it was ugly. So will have to leave those discussions to others. But there are a few of his slighter, lighter books that everyone, or maybe every American, should read. That list would include the early collection of magazine articles that helped make his reputation, The Kandy-Kolored Tangerine-Flake Streamline Baby, which in my opinion is treasurable for the title alone. That essay was about George Barris and the Kustom Kulture movement, which treated hot rods primarily as pop art. Another must-read for those in these environs is The Painted Word. Although it's primarily a send-up, and has certainly been accused of being reactionary—it inspired almost hysterical criticism when it appeared—the central thesis was dead serious and oh-by-the-way correct: that modern art had moved away from being primarily a visual experience. I'll often ask of a photograph, "but is it good to look at?" And the antecedent there is probably Wolfe. The virtual "part two" of that line of cultural criticism was From Bauhaus to Our House, a similar but less controversial look at modern architecture. It's a less famous book—the modernist establishment had learned fast to contain and compartmentalize its outrage—but one that's even more entertaining to read. Having grown up summering in northern Michigan, I love these sentences from the book's opening: "Every new $900,000 summer house in the north woods of Michigan or on the shore of Long Island has so many pipe railings, ramps, hob-tread metal spiral stairways, sheets of industrial plate glass, and white cylindrical shapes, it looks like an insecticide refinery. I once saw the owners of such a place driven to the edge of sensory deprivation by the whiteness & lightness & leanness & cleanness & bareness & spareness of it all." I know just the house he's talking about it. (And that "insecticide refinery" is a small but pure note of his genius—still makes me chuckle.) For entertaining reading, From Bauhaus to Our House is tough to beat. And of course everybody should read The Electric Kool-Aid Acid Test, because it's the single book of Wolfe's that, well, everybody should read. But then, you already knew that. All of these are entertaining reads, still. Wolfe was sui generis. "Open Mike" is the often off-topic, anything-goes editorial page of TOP. Theoretically it appears on Wednesdays. Jack: "My wife was once a dinner party seat mate with Tom. His ice-breaker was 'What are you reading?' Fortunately she had just finished a book he was looking forward to reading himself. So she was the one recommending books. He was an excellent dinner partner as one would expect. And yes, he was all in white. But a photo of Tom must be in color." Luis Aribe: "There is an essay by Tom Wolfe in Marie Cosindas's book, Color Photographs, on her images and on photography and photographers in general. It's a book well worth having just for her photographs, with the added bonus of Wolfe's essay." John Camp: "I was sad to hear about Wolfe's death—he was a major part of the journalism I read when I was trying to decide what to do with my life, and for my decision to become a journalist, although I was never his kind of journalist. "About The Painted Word and From Bauhaus to Our House: There is a strain of what I consider to be fairly serious writing on visual art done by journalists. John Updike wrote three nice books of essays on art, all available at Amazon: Just Looking: Essays on Art, Always Looking: Essays on Art and Still Looking: Essays on Art. Robert Hughes was the Time art critic, but he was really a journalist who wrote on art (and other things) and looked with a skeptical eye upon the antics of the art world: 'The new job of art is to sit on the wall and get more expensive.' His books The Spectacle of Skill, The Shock of the New, and American Visions are all important and available at Amazon and are good and fun reading. "I make a distinction between these guys and 'serious' art critics who are really theorists of modernity and post-whatever. These guys actually went out and looked at art and reported back on what they encountered. Too many serious critics, and particularly those who would get in an uproar and denigrate the work of Wolfe, Updike and Hughes (and they did), might look at some art, but what they reported on were usually artifacts of their own imagination...which was not nearly as rich as they thought it was." Stephen Scharf: "What the hey, no mention of The Right Stuff? Now, that is a good read." Rick Denney: "I still love Mau-Mauing the Flak Catchers. It's probably more controversial than the essays you mentioned, though it resonates with my own flak-catching experience. But it follows the notion that the shorter he wrote, the more taut he became. About The Right Stuff, Neil Armstrong opined that a guy who never left his apartment in Manhattan was unlikely to know what really happened. So, sometimes we read for style more than substance. Wolfe was loaded with it. R.I.P." Bruce Rubenstein: "I can understand having a rough time with Gravity's Rainbow, but Bonfire of the Vanities? Really? Maybe one had to have lived in NYC. I'm also a little surprised by a child of the '60s not mentioning The Right Stuff." Andrew Lamb: "Bonfire of the Vanities falters towards the end. Not sure that it has aged well. Surely, the one to read is The Right Stuff?" Chuck Albertson: "The Right Stuff is brilliant and hilarious, about 20 percent of it made it into the (excellent) movie. If you can find it, a draft of the book first ran in Rolling Stone, with photos by Annie Leibowitz. I also like Mauve Gloves and Madmen, Clutter & Vine, a collection of essays from the '70s that is a rollicking takedown of the Me Generation." Geoff Wittig: "I've always had a soft spot in my heart for Wolfe, despite his writings' tendency to degenerate into self-parody, because of his sincere appreciation for the place of technical skill, of craft, in the visual arts. He wrote a brilliant and heartfelt eulogy for sculptor Frederick Hart exploring this concept; and was predictably criticized for his retrograde philistinism by the gatekeepers of 'contemporary art.' And it's hard not to have a bit of admiration for his ability to pull off the 'dandy' role in an age when it has become largely passé." Mani Sitaraman: "More than four decades ago, when I was 14, I read Tom Wolfe's The Kandy-Kolored Tangerine-Flake Streamline Baby, the very first of his books that I was to read. Suddenly, everything my English teacher told me about writing prose didn't matter anymore. What a blast! "Googling reveals numerous excellent, mannered portraits of Tom Wolfe, who was photogenic. There seem to be two schools of thought regarding images that accompany obituaries of notable public figures who die in old age. The first seems prefer the use of a very recent portrait, to reveal the person as they were in the times just before their passing. The other, like the use of a picture of the person when they first achieved fame. That's my preference, too. Here is a picture of Tom Wolfe in 1968, a couple of years after The Kandy-Kolored Tangerine-Flake Streamline Baby was published. A perfect New York City environmental portrait by Sam Falk for the New York Times. "Rest in peace, Tom Wolfe." Carsten Bockermann: "Back in early 1999 I had the good fortune of meeting Tom Wolfe in New York City, where he was reading out of his then-new novel A Man in Full (great book, in my humble opinion). "Of course, he was dressed in a white suit, just as one would expect." D. Hufford: "I must get over my laziness about writing to write just a bit about Tom Wolfe. After all, as a native West Virginian, I owe him for his portrayal of another native West Virginian, Chuck Yeager, in The Right Stuff. Compare that with what we get nowadays with simplistic, shallow stereotyping stuff as Hillbilly Elegy. "I am not an expert on his work, but that which I have read I have thoroughly enjoyed. I love his ability to gore sacred cows and to irritate those who need to be irritated: "Radical Chic: That party at Lenny’s" [the article in the June 8, 1970 issue of New York magazine —Ed.] is still relevant, today, methinks. And I had started reading Bonfire of the Vanities just a few days ago. I have never watched the movie and although I have only begun the book, I already know the movie would be a disappointment. The scene where the husband who says he is going out to walk the dog and while out mistakenly calls his wife and asks if his girlfriend is there. The surprise and humor and the knowledge that this is the sort of stupid thing real people do would never be shown as well on film. Later, couple living in a small, rather shabby apartment but with pretensions and a British maid are relieved to find that she is racist. Relieved because they had been worried that with her British accent and her past experience of working for wealthier people, she was judging them and looking down on them. Finding her a racist restored their sense of superiority. This seems so real to me. Yeah, that’s the way some of our 'betters' are. "I am sorry to see him go." Jack: "Tom wrote The Right Stuff in book form in 1979. It made a hero of Chuck Yeager to the people who hadn’t followed flying by explaining how he first broke the sound barrier in a rocket plane. To me, I didn’t need to read the book for him to be my hero. Months before the book was published, I was with General Yeager on the Bonneville Salt Flats with a small group attempting to break the sound barrier on land in the Budweiser Rocket Car. So naturally we brought the General in for the effort. The test run at 400 miles an hour was scary as the nose raised up off the ground and the nose wheel was how the driver steered. The telemetry was analyzed to determine how much adjustment would be required in the forward fin to keep the front from lifting off without also pushing it into the salt flats. In 1979 things were slow to compute and it took six hours to calculate. Five hours before that, Chuck told me he estimated it would require 6 degrees angle down. After much calculating over the hours, the computer declared a recommended angle of down 5.9 degrees. Chuck looked at me and said, 'See, I’ve still got it.'" I'm very sorry to learn of the loss of Chuck Westfall. In case you don't know the name, Chuck was the ultimate tech rep. He later became the main media contact for Canon Camera in America, but he never stopped being a great tech rep—a guy who knew everything about every one of his company's products and who was unfailingly gracious about explaining to you what you needed to know at any time. I first encountered Chuck on the old CompuServe in the early 1990s, where he represented Canon and I represented Camera & Darkroom magazine. He and I learned together how not to get into "flames" with people—right at first we had both tended to be hotheads and get into arguments, and several times we discussed with each other the best ways not to do that. (He learned faster than I did.) He was a great contact for me when I was the Editor of Photo Techniques in the latter half of the '90s. He was very ethical and had strong boundaries—other tech reps liked to gossip, and I finagled a lot of juicy tidbits out of various people over the years, but never Chuck. At the same time he was unfailingly generous with his expertise, as long as sharing it was within his purview. He never distinguished between Canon shooters and others—if it had to do with Canon products, you could count on Chuck to know it and share it. I don't think there was ever a better-known tech rep of any camera company in this country. Gordon Lewis wrote to me this weekend, "I thought it curious that someone from a camera company could become a celebrity, at least among photographers. He always struck me as quiet and self-effacing—and yet I can’t think of anyone else with comparable notoriety from Nikon, Sony, Fuji, etc." Nor can I. He even became the victim of a spoof site in the early days of digital, called "Fake Chuck Westfall." He hated it, but he never railed against it—he just kept being the same dependable real Chuck Westfall. Even the real Fake Chuck Westfall, Karel Donk, said this about the real one when he wrapped up his satirical blog: "I don’t know if real Chuck Westfall ever knew who Fake Chuck was, and if he did, he didn’t get it from me. I do have to say that I’ve often communicated with Chuck Westfall regarding feedback and technical information related to Canon cameras and lenses—before and after I started the FCW blog. He’s always been very polite and helpful to me, often taking the time to send me elaborate responses and information, even while I was sending him criticism." Just my guess, but I think Chuck knew exactly who Karel was and treated him with respectfulness and helpfulness anyway. That would be very typical of Chuck. Canon FD 55mm ƒ/1.2 AL was first marketed in March, 1971. We had a little game for a while in the '90s when I'd try to devise testers for him, questions designed to foil his mighty Canon knowledge, and over a handful of tries I was never able to stump him. And if he didn't know something (which slightly irked him, although he would barely show it), he would get the answer for you pronto. He was the hardest-working company rep, too: I once received the answer to a technical question, polite and businesslike as usual, timestamped late on a Saturday night. Chuck Westfall was an integral part, in North America, of the glory years at Canon Camera. And yet he was certainly no robot. Only once over the many years did I get a warmly emotional note from him, and that was after I sent him congratulations on the birth of his daughter. It's safe to say no man was ever more delighted by the arrival of a child. We'll all miss Chuck, but my guess is that the thing he regrets the most about leaving this Earth is having to leave her and her mother behind. Kenneth Tanaka: "A lovely recollection, very fitting as a eulogy. Regrettably I never met Chuck. But as a long-time devotee of Canon’s photo products I feel as though I knew him through his extensive explanatory writings. When I read of his death last weekend I felt I’d lost a friend. And, indeed, I had. My deepest condolences to Mr. Westfall’s family circle." Michael Perini: "I only met Chuck once, I didn't seek him out, he found me...it was on the show floor of PhotoPlus in NY in October of 2007. I had a very early copy of the Canon 1Ds Mark III and had had a less than enlightening chat with a counter person. Chuck either saw it or sensed it because he walked over, introduced himself, gave me his card, and asked if I was a CPS member. I said not yet. He scribbled a room number on another card and said go downstairs and see these guys, give them this, and tell them to sign you up. They will help you with anything you need. "I did and have been a member of CPS ever since. I was really struck by the 'above and beyond' attitude—he wasn't looking for chit chat; he wanted to help and be on his way to the next guy." Michael Tapes: "Chuck was a role model for human respect and interaction. Generous and kind. He will be sorely missed at so many levels. Godspeed, Chuck." "When you are a teenager so taciturn that your older brothers say things like 'You don't use your mouth, so maybe you'll use your eyes,' when you are retiring, fitful, vulnerable, anxious, then being able to take refuge behind the eyepiece of a camera, behind a mask that enables you to see without being seen, is a great comfort. When you are a young man at odds with yourself and later admit that you were torn between 'the fear of getting too close to people and another force that egged me on to get a closer look,' then being the man with the invisible face who makes other faces visible is rather a neat solution. When you are the fifth child in a large middle-class family involved in business, banking, and stocks, when you've been schooled in engineering, groomed for the workaday world, and destined for a job at the plant, then your father's Vest Pocket Kodak, or the Leica he's given you, become instruments to guide you towards wide open spaces, and photography gives you a license to roam." Roam he did. More than thirty books have been published of his work, including many pictures from Asia and the Indian subcontinent. What I remember most about him is something another Magnum photographer told me about him: that, despite being a photojournalist, he declined on principle to photograph mayhem...no violence, carnage, blood, war, or suffering. "I have always been more sensitive to the beauty of the world than to violence and monsters," he said. He took many pictures you have no doubt seen, of the Watergate hearings, the Great Wall of China, an improbable painter poised on a girder of the Eiffel Tower looking like a cross between Buster Keaton and a mime, or two black boys, blurred, shadowboxing on a beach in the gloaming. 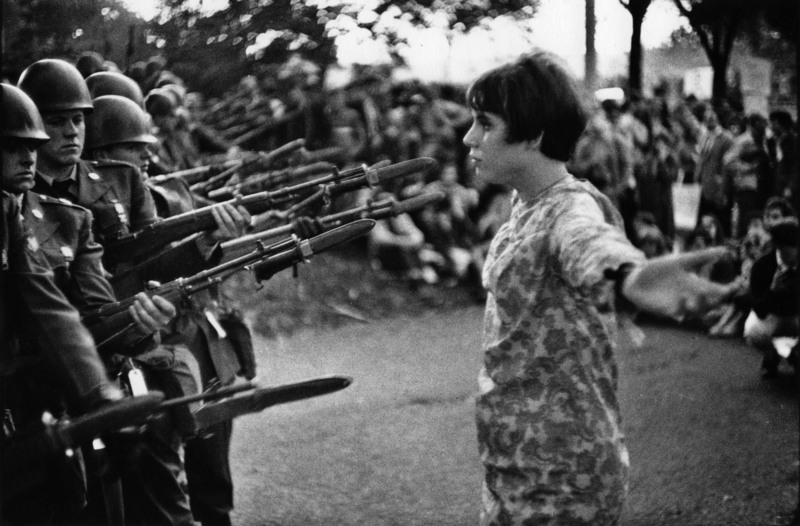 His signature image distills the "flower power" of the 1960s: a young woman holding a flower in front of a line of National Guard soldiers with bayonets at the ready. Like many big hits I tired of that one long ago; in the Riboud picture that first comes to my mind when I think of him, we are looking down from above at a broad marsh, with a strip of sky at the top and a patch of dry land at the bottom, where a distant man in a white shirt is lying on the ground with his hands behind his head, as if to say, ah! This is the life. Although his style and his concerns have moved back in time significantly since I first engaged with him, his work remains well worth getting to know if you don't know it already, with its gentle arm's-length humanism. He died last Tuesday, at 93. There are many obituaries, including those at the New York Times; at Magnum where he was a member until 1979 and still revered; at TIME magazine; at PDN, and at The Guardian, among others. He is survived by his wife and four children. Note: TOP claims Fair Use in reproducing the photo of Marc Riboud from his website, but we have applied for permission to use it and will remove it on request. Joe Holmes: "Digging around, I stumbled across a couple of outtakes from the more famous shots of the flower power protester and the Eiffel Tower painter. Unfortunately, they're pretty small images, though here's a giant reproduction of that flower power outtake. And finally, this is actually my favorite Riboud image. Talk about framing!" Well this is one post I hate like hell to have to write. We are terribly saddened to learn of the death of Emmet Mann, most famous to the world as one of the luminous subjects of one of the great American photobooks of the 20th century, his mother Sally's Immediate Family. As an adult he suffered from schizophrenia, and worked as a landscaper. He had many interests and causes; he was a musician, aspired to be a writer, and had many friends. Our sorrows and heartfelt condolences to Sally and Larry, his sisters Jessie and Virginia, and all his family members and friends. He was 36.